Engineers, as practitioners of engineering, are professionals who invent, design, analyze, build, and test machines, systems, structures and materials to fulfill objectives and requirements while considering the limitations imposed by practicality, regulation, safety, and cost. The word engineer is derived from the Latin words ingeniare and ingenium ("cleverness"). The foundational qualifications of an engineer typically include a four-year bachelor's degree in an engineering discipline, or in some jurisdictions, a master's degree in an engineering discipline plus four to six years of peer-reviewed professional practice and passage of engineering board examinations. Quackery, often synonymous with health fraud, is the promotion of fraudulent or ignorant medical practices. A quack is a "fraudulent or ignorant pretender to medical skill" or "a person who pretends, professionally or publicly, to have skill, knowledge, qualification or credentials they do not possess; a charlatan or snake oil salesman". The term quack is a clipped form of the archaic term quacksalver, from Dutch: kwakzalver a "hawker of salve". In the Middle Ages the term quack meant "shouting". The quacksalvers sold their wares on the market shouting in a loud voice. In electronics, a vacuum tube, an electron tube, or valve or, colloquially, a tube, is a device that controls electric current flow in a high vacuum between electrodes to which an electric potential difference has been applied. A bifilar coil is an electromagnetic coil that contains two closely spaced, parallel windings. In engineering, the word bifilar describes wire which is made of two filaments or strands. It is commonly used to denote special types of winding wire for transformers. Wire can be purchased in bifilar form, usually as different colored enameled wire bonded together. For three strands, the term trifilar coil is used. Hieronymus subsequently designed solid-state versions of his Analyzers, substituting germanium transistors for crystal prisms and tunable capacitors for the rotating armature. He also designed and built various specialized devices designed for specific functions, including analysis of living organisms and production of homeopathic remedies. The most well-known Hieronymus Machine is the Eloptic Medical Analyzer, which supposedly analyzes and transmits eloptic energy to diagnose and treat medical conditions in plants and animals. Germanium is a chemical element with symbol Ge and atomic number 32. It is a lustrous, hard, grayish-white metalloid in the carbon group, chemically similar to its group neighbours silicon and tin. Pure germanium is a semiconductor with an appearance similar to elemental silicon. Like silicon, germanium naturally reacts and forms complexes with oxygen in nature. 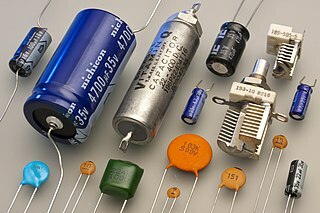 A capacitor is a passive two-terminal electronic component that stores electrical energy in an electric field. The effect of a capacitor is known as capacitance. While some capacitance exists between any two electrical conductors in proximity in a circuit, a capacitor is a component designed to add capacitance to a circuit. The capacitor was originally known as a condenser or condensator. The original name is still widely used in many languages, but not commonly in English. Homeopathy or homœopathy is a system of alternative medicine created in 1796 by Samuel Hahnemann, based on his doctrine of like cures like, a claim that a substance that causes the symptoms of a disease in healthy people would cure similar symptoms in sick people. Homeopathy is a pseudoscience – a belief that is incorrectly presented as scientific. Homeopathic preparations are not effective for treating any condition; large-scale studies have found homeopathy to be no more effective than a placebo, indicating that any positive effects that follow treatment are not due to the treatment itself but instead to factors such as normal recovery from illness, or regression toward the mean. The theory of operation on which Hieronymus Machines are based is that all matter emits a kind of "radiation" that is not electromagnetic, but exhibits some of the characteristics of both light and electricity. The quality of this emanation is unique to every kind of matter, and therefore can be utilized for detection and analysis. Hieronymus coined the term "eloptic energy" to describe this radiation (from the words "electrical" and "optical".) All of his machines were designed to detect and manipulate this eloptic energy. Eloptic emanations have never been detected by instruments designed to measure electromagnetic energies, no other evidence of their existence have been produced, and there is no mathematical theory of an eloptic field, so the theory is considered pseudoscientific and is not accepted by science. Electromagnetism is a branch of physics involving the study of the electromagnetic force, a type of physical interaction that occurs between electrically charged particles. The electromagnetic force usually exhibits electromagnetic fields such as electric fields, magnetic fields, and light, and is one of the four fundamental interactions in nature. The other three fundamental interactions are the strong interaction, the weak interaction, and gravitation. At high energy the weak force and electromagnetic force are unified as a single electroweak force. An optical spectrometer is an instrument used to measure properties of light over a specific portion of the electromagnetic spectrum, typically used in spectroscopic analysis to identify materials. The variable measured is most often the light's intensity but could also, for instance, be the polarization state. The independent variable is usually the wavelength of the light or a unit directly proportional to the photon energy, such as reciprocal centimeters or electron volts, which has a reciprocal relationship to wavelength. A spectrum is a condition that is not limited to a specific set of values but can vary, without steps, across a continuum. The word was first used scientifically in optics to describe the rainbow of colors in visible light after passing through a prism. As scientific understanding of light advanced, it came to apply to the entire electromagnetic spectrum. Perpetual motion is motion of bodies that continues indefinitely. A perpetual motion machine is a hypothetical machine that can do work indefinitely without an energy source. This kind of machine is impossible, as it would violate the first or second law of thermodynamics. The Dean drive was a device created and promoted by inventor Norman Lorimer Dean (1902–1972) that he claimed to be a reactionless drive. Dean claimed that his device was able to generate a uni-directional force in free space, in violation of Newton's third law of motion from classical physics. His claims generated notoriety because, if true, such a device would have had enormous applications, completely changing human transport, engineering, space travel and more. Dean made several controlled private demonstrations of a number of different devices, however no working models were ever demonstrated publicly or subjected to independent analysis and Dean never presented any rigorous theoretical basis for their operation. Analysts conclude that the motion seen in Dean's device demonstrations was likely reliant on asymmetrical frictional resistance between the device and the surface on which the device was set, resulting in the device moving in one direction when in operation, driven by the vibrations of the apparatus. The water fuel cell is a technical design of a "perpetual motion machine" created by American Stanley Allen Meyer. Meyer claimed that an automobile retrofitted with the device could use water as fuel instead of gasoline. Meyer's claims about his "Water Fuel Cell" and the car that it powered were found to be fraudulent by an Ohio court in 1996. Newman's Energy Machine was a DC motor which the inventor, Joseph Newman, claimed to produce mechanical power exceeding the electrical power being supplied to it. In 1979, Newman attempted to patent the device, but was rejected by the United States Patent Office as being a perpetual motion machine. When the rejection was later appealed, the United States district court requested that Newman's machine be tested by the National Bureau of Standards (NBS). The NBS concluded in June 1986 that output power was not greater than the input. Thus, the patent was again denied. The scientific community has rejected Newman's ideas about electricity and magnetism as pseudoscientific and his claims as false. George Walter de la Warr was born in the Northern England, and in later life became a civil engineer in the pay of Oxfordshire County Council. In 1953 he resigned from this post to work on the controversial field of radionics, in which he was a pioneer. His devices were denounced by medical experts. Georges Lakhovsky was a Belarusian-French engineer, scientist, author and inventor. His controversial medical treatment invention, the Multiple Wave Oscillator, is described as having been used by him in the treatment of cancer. A torsion field is a feature of pseudoscientific proposals that the quantum spin of particles can be used to cause emanations to carry information through vacuum orders of magnitude faster than the speed of light. This theory is the basis of a number of unfounded claims and scams. An infrared gas analyzer measures trace gases by determining the absorption of an emitted infrared light source through a certain air sample. Trace gases found in the Earth's atmosphere get excited under specific wavelengths found in the infrared range. The concept behind the technology can be understood as testing how much of the light is absorbed by the air. Different molecules in the air absorb different frequencies of light. Air with lots of a certain gas will absorb more of a certain frequency, allowing the sensor to report a high concentration of the corresponding molecule. The Silver Crown is a children's science-fiction book by Robert C. O'Brien. Published in 1968, it was his first novel. Desiré D. Dubounet is an American alternative medicine quack currently living in Budapest. Dubounet developed the pseudoscientific Electro Physiological Feedback Xrroid, an energy medicine device that is considered to be dangerous to health and has been described as a scam. Campbell, John W. Jr. “Psionic Machine — Type One”, Astounding Science Fiction, June 1956, pp. 97–108. 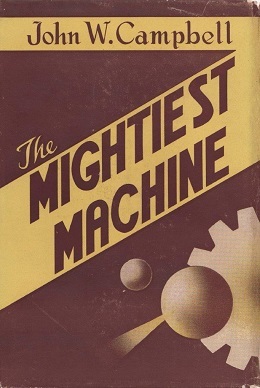 Campbell, John W. Jr. “Correction and Further Data on the Hieronymous Machine”, Astounding Science Fiction, August 1956, pp. 112–114. Goodavage, Joseph ; “An Interview with T. Galen Hieronymus”, Analog Science Fiction, January 1977. Hieronymus, T. Galen & Sarah (September 1976). The Eloptic Directory. Advanced Sciences and Research, Inc (documentation for the Hieronymus Eloptic Analyzer machine). Hieronymus, T. Galen (January 1988). The Story of Eloptic Energy. Institute of Advanced Sciences, Inc.